TheArmenianKitchen.com : ‘Armenian Vegan’, a perfect cookbook for the New Year! ‘Armenian Vegan’, a perfect cookbook for the New Year! If you’ve been following The Armenian Kitchen for a while, you already know how much I love a good cookbook – old or new. My nephew informed me of a cookbook new to the market, that he felt would be of interest to me. The cookbook, ‘Armenian Vegan’ was written by Dikranouhi Hovsepian Kirazian - a six-year project which has now become a reality. 1. Its recent release is perfect timing for those who have resolved to eat a healthier diet in the new year. 2. The cookbook’s author happens to be Archbishop Vatche Hovsepian’s sister, and, my cousin Vivian Hovsepian’s sister-in-law! It’s a very small world in the Armenian circle. 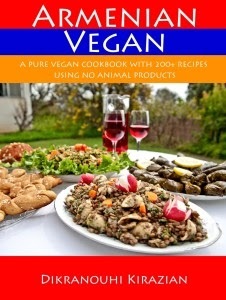 Wishing to add ‘Armenian Vegan’ to my already overflowing cookbook collection, my husband dutifully ordered me a copy. After spending much time perusing each chapter, it became clear that the recipes are not only for those following a vegan lifestyle, but for anyone attempting to eat healthfully, while wishing to enjoy their favorite Armenian recipes. If this sounds intriguing, then this cookbook is for you. Click here for information on how to purchase a copy.